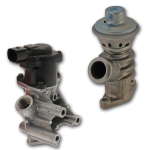 Cambiare has recently extended its range of EGR valves and has now over 150 part numbers catalogued, including over 90 Pierburg references. These new additions cover popular applications such as the Audi A3 06/03-05/10, VW Passat 2007>, Range Rover 2004>, Citroën C4 09/04-12/11, Ford Mondeo Mk III 2000>; Mercedes A, B Class 2005> and many more. All Cambiare references are either OE quality or BER compliant. Both pneumatic and electric EGR valves are available. To find out more speak to your local Cambiare representative.